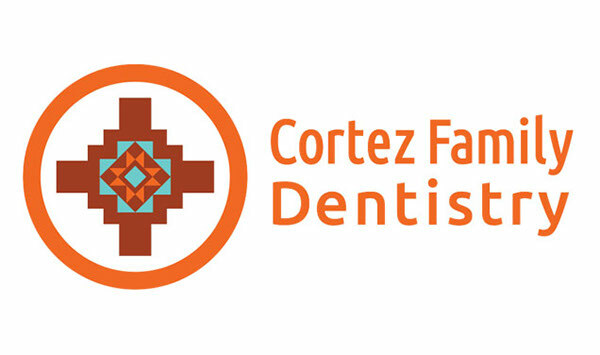 Cortez Family Dentistry, a dental practice in Cortez, Colorado contacted me to help them develop a logo for their new practice. 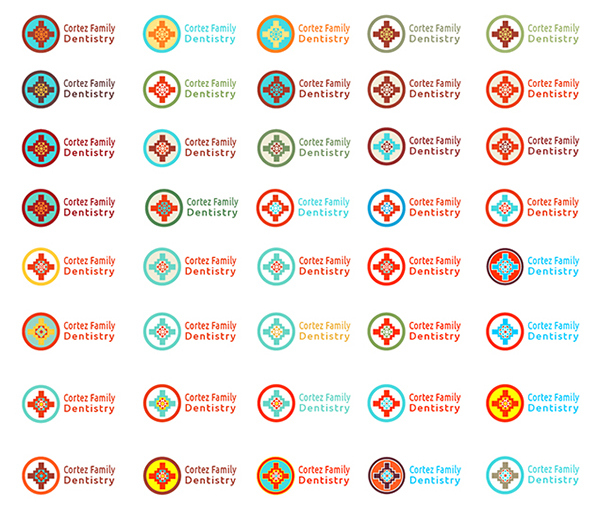 Dr. Ned and his wife Errin were moving from NW Washington back to Colorado and they were taking over an existing dental practice and wanted to make a recognizable logo to define their business and build their brand. We held a meeting so I could ask a series of questions in order to develop a design brief. Dr. Ned and Errin had identified that the primary message their logo needed to convey was precision and compassion. 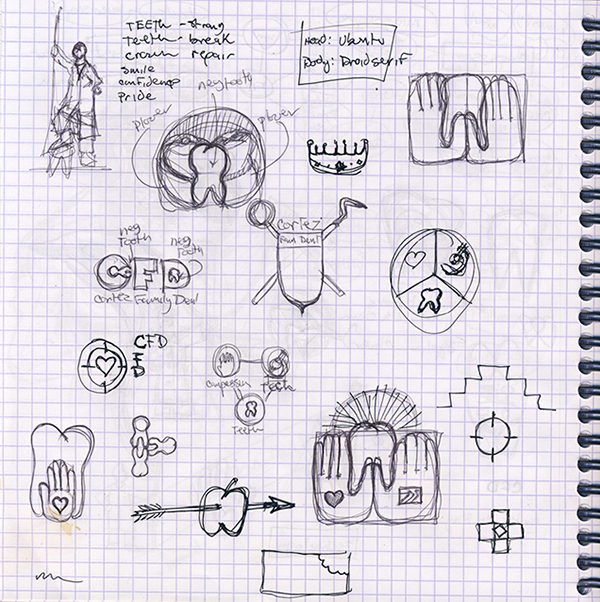 It was also a goal of mine to develop designs where an uprooted tooth wasn’t the primary graphic. The “pulled tooth” icon has been identified dentists from the beginning of the profession. 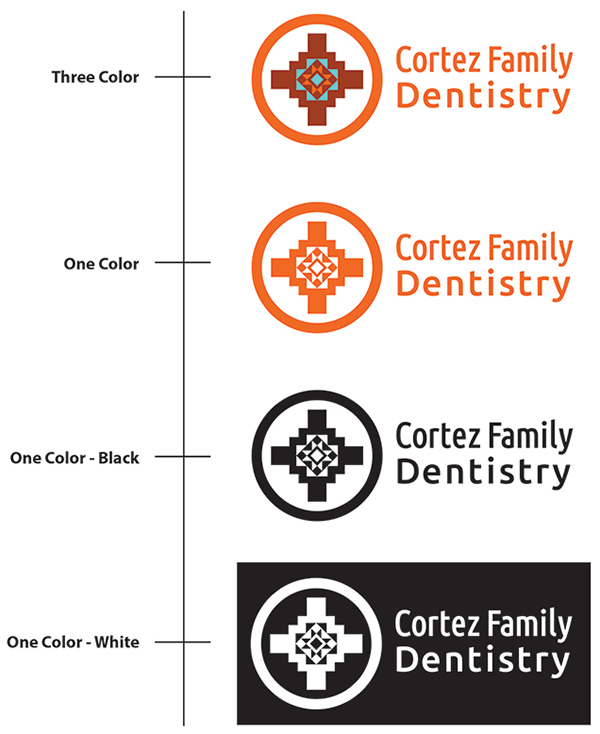 Besides being overused, it represents a traumatic procedure, so we asked; “if the tooth was to be shown, how could it be presented in a unique light to differentiate it from the other tooth centered dental logos”. Another important element to Dr. Ned’s practice is that he incorporates cutting edge microscope technology that only 4% of other dentists in the U.S. are using right now. And his philosophy is that the higher level of treatment allows him to be more precise, and allows for longer lasting dental care. This was the primary focus in the logo they chose to represent their company. 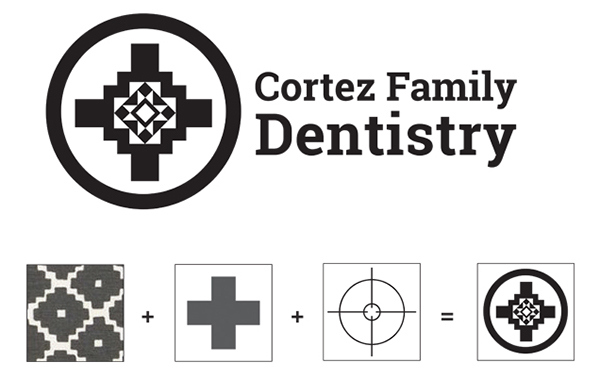 I presented a range of three layout options to the client – the logo that was chosen I call the “Cortez Cross” and it was derived from a Hopi ziggurat design to tie it into the local culture, a medical cross because it’s recognized as the universal icon for health care, and a cross hairs because it’s universally recognized icon for precision and accuracy. 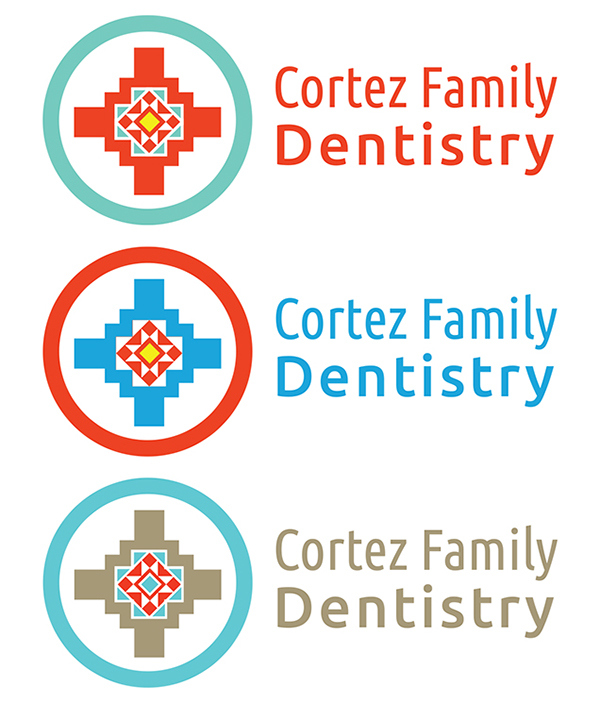 Compared to the other logo options, the clients liked having “Cortez Family” side-by-side and stacked on the word “Dentistry”, but there was a concern that there needed to be more emphasis on the words Cortez Family. In the second round I presented a new version that incorporated a compressed and regular version of Ubuntu. Using the compressed typeface for the words Cortez Family allowed me to increase the point size and provide more emphasis to the text. Once the logo was chosen it was time to explore color palettes. I had several ideas in mind, and the client suggested using colors found in the South Western Colorado landscape, so I gathered several palette suggestions and mixed and matched several of the options to close-in on the combination I was seeing in my mind. There were many combinations that were explored to learn how the application of color changed the impact of this logo. A red cross feels much differently than a blue cross and it’s possible to achieve different moods with the same colors applied in different areas. The first color combinations I presented to the client focused on a turquoise blue, bright red and a hit of yellow or green. It turns out that the intensity of the colors got a mixed reaction. They felt the red was a little too urgent, and there were questions if the blue and green logos were a good match to what they had envisioned. I shared some further examples with Dr. Ned and Errin based on their comments in our meeting, and they felt more comfortable when they saw the warmer colors applied to the logo. The colors aren’t as saturated, but they’re still vibrant. The deep brick red is closer in hue to the red soil around Cortez, and is another way the logo ties in to the community. 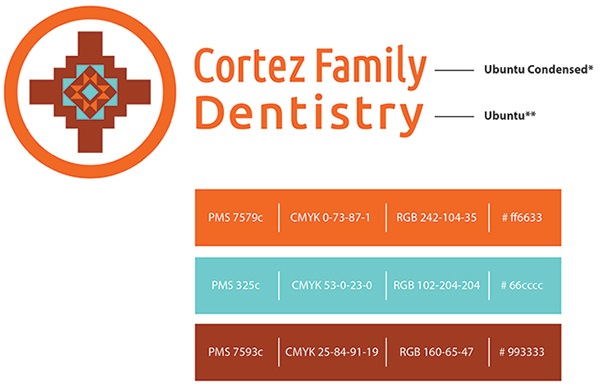 This deep color is balanced with a rich sunset orange and a turquoise inset in the heart of the logo. 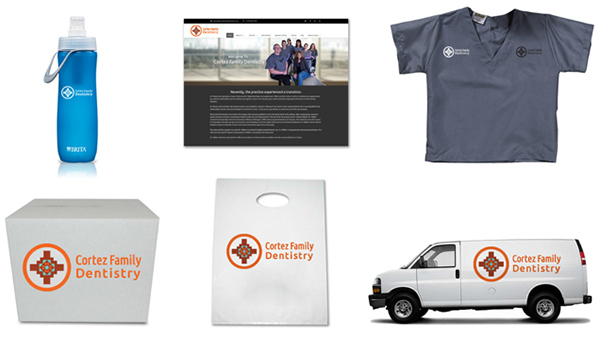 Throughout the process I applied the logo samples to several items I thought might help provide a real-world view of the logo being used so the clients could properly judge what it looks like within context of their website, scrubs, take away bag, and business card. The final stage in creating the new brand was to generate the appropriate color mixes for all the color spaces the logo might appear as well as define the logo art for single color spaces. 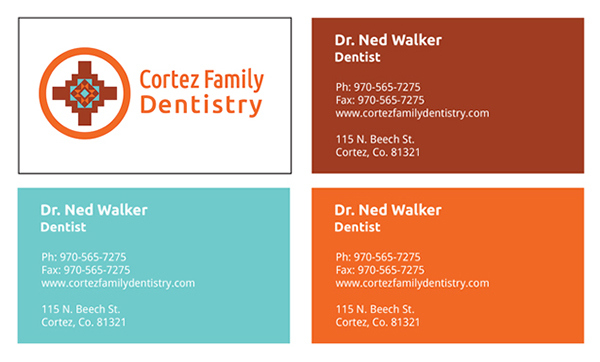 A dentist in Cortez Colorado asked me to help develop a logo for his new practice.